At National Gallery In Washington, Visitor Attacks Gauguin Painting : The Two-Way The woman was arrested after banging on the French Post-Impressionist painter's 1899 work. After an initial inspection, the painting looks to be OK, the woman is facing multiple charges including destruction of property. Screaming "This is evil," a woman tried to pull Gauguin's "Two Tahitian Women" from a gallery wall Friday and banged on the picture's clear plastic covering, said Pamela Degotardi of New York, who was there. "She was really pounding it with her fists," Degotardi said. "It was like this weird surreal scene that one doesn't expect at the National Gallery." The woman was restrained and detained and is facing charges of destruction of property and attempted theft. 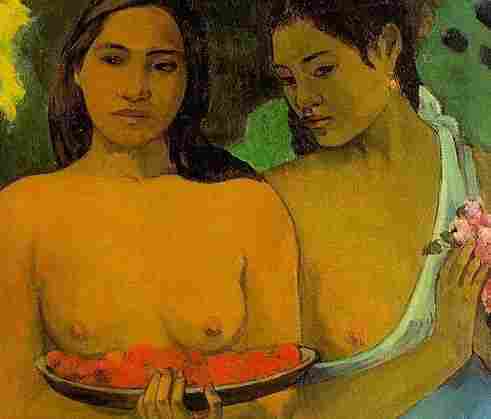 Paul Gauguin's Two Tahitian Women. 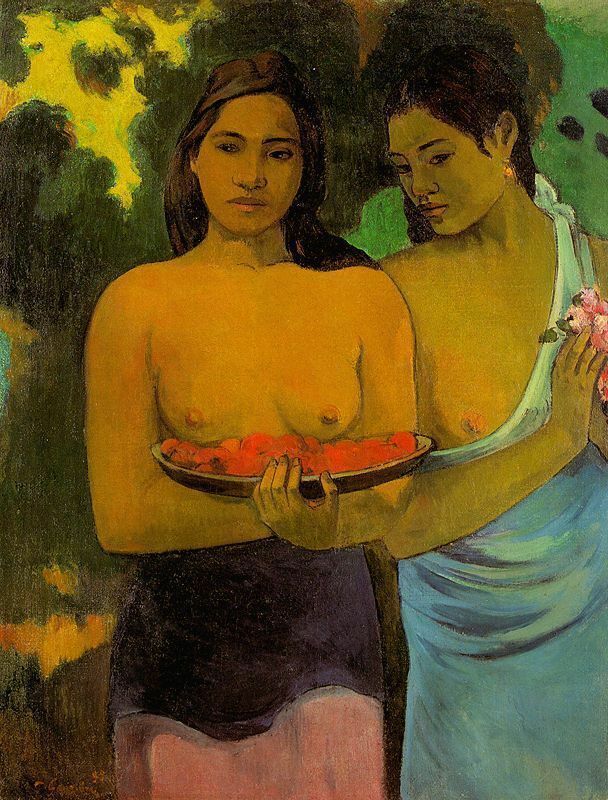 Gauguin's Two Tahitian Women is a 48-inch by 40-inch oil-on-canvas painting that portrays one woman with both her breasts exposed and another woman with one breast exposed. NPR member-station WAMU reports that the piece is now at the Gallery's conservation lab. The painting is on loan from the New York Metropolitan Museum. ... Experts from the New York Metropolitan Museum of Art and the National Gallery will examine the painting under a microscope. "They'll look at it intensely — the surface — to make sure that there are no microfissures. The frame is fine, the painting looks fine initially as well," says Deborah Ziska, spokeswoman for the National Gallery.